A light facial mist that has a blend of 100% natural delicious ingredients to stimulate your mind and put everything back into balance. 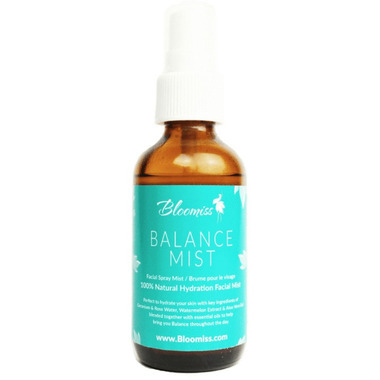 Balance mist also hydrates your face, sets your make up and tones your face. 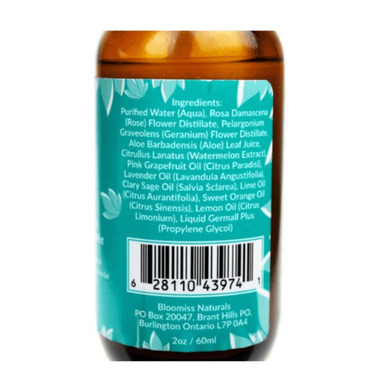 4 Key ingredients starting with the beautiful aroma of geranium and rose water along with anti-inflammatory properties as well as keeping the skin hydrated; aloe vera gel to sooth your skin; watermelon extract rich in Vitamin C and protects skin from daily toxins and promotes cell renewal. Over all this blooming balance mist is great. I only using it just to set my make up, the result are amazing and keep my make up last all day. The reason I gave 4 rating because of the herbal smell of it which is I don't like it that much. If you don't mind the smell this product can stand side by side with the high end setting spray. I am torn with this review because when I put this on it makes my face red and my skin sting.... so obviously something's not right. But afterwards my skin does feel tighter, smoother and fresher so this may work for some of you who aren't as sensitive as me. I do think its a good product just not for me. This is a nice product. The scent is a bit strong at first but is lovely smelling, a good balance of geranium and citrus. I was using my toner as a mist to set my makeup but found it made my skin feel a bit dry, whereas with this product my skin feels hydrated.